This means the PM10 daily limit value for a whole year has been breached in London in less than four months. This is more than two months earlier than last year. “It is shocking that the legal standard, which is itself twice the World Health Organisation (WHO) guideline for human exposure, has been breached for the whole of 2011 before the end of April. This is more than two months earlier than last year. “Mayor Johnson’s backward steps have aggravated London’s air pollution problems. These have included deferring Phase 3 of the low emission zone from 4 October 2010 to 3 January 2012 and rejecting advice from his own consultants on the actions needed to tackle PM10 exceedances at hotspots. “The Mayor has backed himself into a corner where the only way to avoid £300m fines per year looks likely to be a prolonged odd and even number plate ban. Such a ban is looking inevitable also to keep London moving during the Olympics as the Mayor continues to refuse to introduce an inner low emission zone. “The Mayor should be giving Londoners advice about protecting themselves (adaptation) and reducing air pollution for themselves and others (mitigation). People should be walking down side streets not busy roads and walking or cycling or using public transport rather than driving particularly older diesel vehicles. Who has warned people that bonfires over Easter will make air pollution worse still in London? “We need Mayor Johnson and the Government to tackle an invisible public health crisis with as many premature deaths attributable to air pollution in London in 2008 as we thought occurred during the Great Smog of 1952. PM10 limit values were put in legislation in 1999 and have been required to be met since 1 January 2005. Under European Union (EU) and UK air quality laws, daily mean concentrations of PM10 in ambient air may not exceed 50 μg/m3 on more than 35 days in a calendar year and annual mean concentrations may not exceed 40 μg/m3. The EU directive on ambient air quality and cleaner air for Europe 2008/50/EC (Air Quality Directive) gave Member States the opportunity to apply for a time extension until 11 June 2011 to comply with these limit values. The UK’s first application was rejected by the European Commission (Commission) in December 2009 and the second was granted a ‘temporary and conditional exemption’ on 11 March 2011. 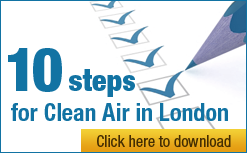 The main condition is that the UK must amend the London air quality plan by 11 June 2011 and submit it to the European Commission by 30 November 2011. Until the UK satisfies fully the terms of the exemption it does not have a time extension. If the UK obtains a time extension, the European Commission would close infraction proceedings against the UK for historic breaches of PM10 limit values. With no time extension obtained yet by the UK for PM10, this represents the seventh successive year of such breaches of health based air quality laws since they entered into force on 1 January 2005. See paragraph 21 on page 5 of the Commission’s decision referred to below. Article 22 of the Air Quality Directive requires that Member States applying for a time extension ‘shall demonstrate how conformity will be achieved with the limit values before the new deadline’. This seemed an overly optimistic projection at the time and has now been shown to be so. The Commission granted a temporary and conditional exemption in the Greater London Urban Area from the EU’s air quality standards for PM10. In doing so the Commission considered there may be a risk of the PM10 daily limit value being exceeded after the exemption period ending on 11 June 2011. The time extension reapplication to comply with the PM10 daily limit value in London was therefore granted on the condition that short-term measures are introduced to control, or, where necessary, suspend activities which contribute to the risk of the limit values being exceeded. See paragraph 21 on page 5 which sets out the conditions required to obtain a time extension. It is clear now that short-term measures to control exceedances of the PM10 daily limit value, such as dust suppressants, are not working effectively in London. This is not surprising given that the Mayor of London has rejected the recommendations of his own consultants to introduce more meaningful measures. It seems likely the Commission will judge the condition not met unless the UK stops further exceedances of the PM10 daily limit value. When granting the ‘temporary and conditional exemption’ the Commission froze rather than closed infraction action against the UK for breaches of the PM10 daily limit value since January 2005. This means the Commission does not need to send the UK first and second/final written warnings again before referring the UK to the ECJ. The Commission is in an ideal position therefore to refer the UK to the ECJ and seek a judgement against it. If the UK did not comply with such a judgment, the Commission could send the UK further first and second/final written warnings after which it could ask the ECJ to impose unlimited lump sum and daily fines on the UK. These have been estimated by the Mayor at £300m per year per pollutant. One of the first acts of the Government once the Localism Bill receives Royal Assent may be to write to Mayor Johnson putting him on formal notice that London will be responsible for any fines arising over breaches of the PM10 limit values in London. Any breaches of the PM10 limit value after 2011 would be unlawful. Worse, assuming there is an ECJ judgement against the UK for historic non-compliance with these standards, the UK could found in contempt of Court and therefore face the imminent prospect of unlimited lump sum and daily fines. “…I am very confident that we will meet our limit values for PM10s by 2011.” Attached as a separate file. 8. Details of ‘Bad Air Day 2010 for particles’ See CAL update.